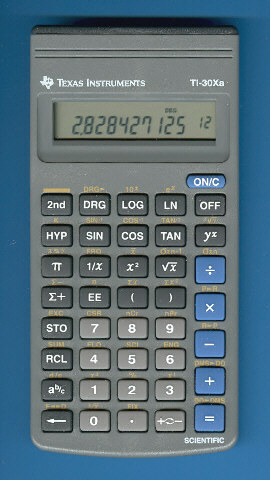 The TI-30Xa replaced the predecessor TI-30X within two years. The only enhancement was the added Constant-key. Like the solar variant TI-30Xa SOLAR this model got two years later a smoother housing. View the next TI-30Xa here. The internal construction of the TI-30Xa is identical with the original TI-30X but instead of a Toshiba T6A51 single-chip calculator circuit it makes use of the T6M80A. The TI-30Xa is still affected from the Logarithm Bug introduced already in 1991 with the TI-35X. © Joerg Woerner, July 1, 2002. No reprints without written permission.